Into a non-stick pot, combine all the vegetables with a cup of water and turmeric. Cover and cook till the vegetables become tender. Grind the coconut gratings with garlic and cumin to make a paste. Add this masala and the slit green chillies to the cooked vegetables, cover and cook for 5minutes. Once the masala is cooked through add in the mango/ tomato slices and salt. Temper the mustard, curry leaves, shallots and red chillies. Pour the tempering over the cooked vegetables. Simmer for 5 minutes. Take off the flame and add in the beaten yogurt. Once the yogurt has blended in well, drizzle in coconut oil and serve. Owing to the busy weekends that we have due to other commitments, lunch on Saturdays is rather elaborate at home. I do ensure there is a vegetable saute, thoran and non-vegetarian accompaniments to compliment the dishes I make for the day. Harini on her blog has posted her recipe on Avarakkai Poduthuval thought I'd try the same except substituted the coconut gratings for slivers simple, because that's what I had stored in my freezer. I was too plain lazy to go through the ordeal of grating the coconut. I have made some minor changes to the original recipe to suit our taste buds.Plus I'm sending in this entry to the Singing Chef and Zlamushka for the event 'Tried and Tasted' from Sunshine Mom's Tongue and Ticklers. Into a pan, cook the beans until al-dente with turmeric, salt and a dash of water. Into a wok, splutter mustard seeds, add the shallots and fry till browned. Add in the garlic and fry for a minute. Tip in the cooked beans and fry for 3minutes on medium flame. Add in the cumin powder, coconut gratings/ slivers and green chilly cook for another minute or two. Take it off the flame and garnish with curry leaves. And eat it whilst its still hot! 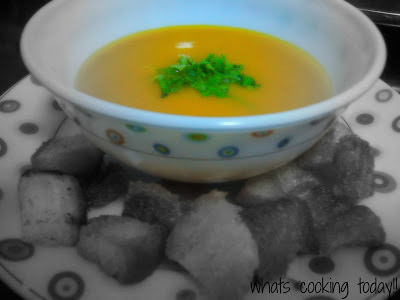 Meat monsters such as our family need something as simple as a soup to mellow our diet. Especially after you attend a nice wedding where all kinds of meat from chicken, pork and fish were served, and you take every opportunity on savoring good measures of each dish. So this week we decided that we stick to soups for a nutritious and healthy us..I decided on a recipe from my aunt on Carrot and Coriander Soup. 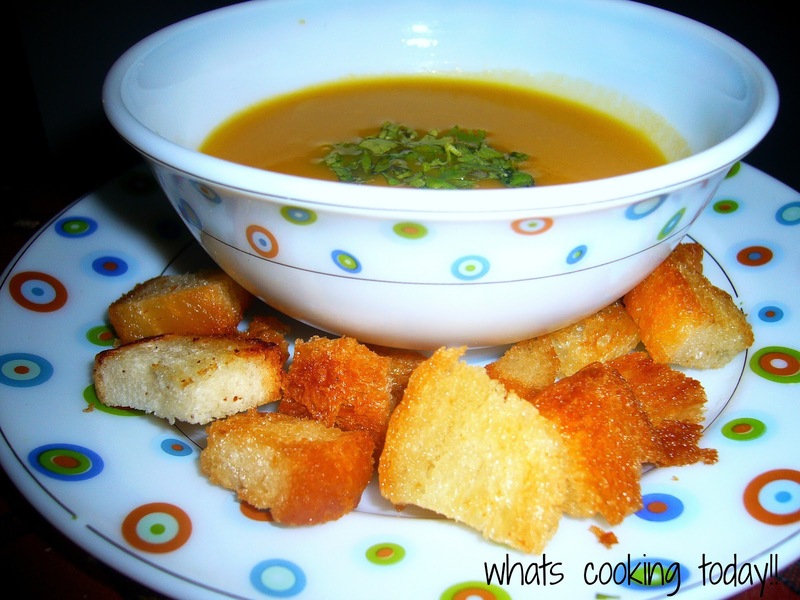 I'm also sending this vegan/ vegetarian soup for the theme: 'Soup for the happy soul' this month's monthly mingle hosted by Harini. Melt butter into a saucepan, saute the onion and grated ginger. Stir over a medium flame till the onions become transparent pink. Add in the water, crumbled stock cubes and carrots and bring to a boil. Cover and simmer for about 8-10minutes until the carrots are tender. Blend the mixture once slightly cooled, stir in the coriander. Cool and refrigerate for 2 hours before serving or serve warm with some croutons. Peel and quarter the apple. Remove the core and and dice the apple into cubes. Sift the flour and into a mixing bowl combine butter, sugar and apple. Stir until all is mixed well. Then make a hole in the center and add the beaten egg, milk all at once. Mix well. Careful not to over beat. Spoon the mixture two thirds full into greased muffin tin and bake for 15-20minutes into a preheated oven of 180 C. Serve warm with butter or strawberry jam. Saturday nights we would always have cousins or friends sleeping over at our place, so one of the Saturdays I thought I'd go in for a vegetable bake rather than the usual meat and roti combination. All who come here are big time meat/fish lovers....including us! Without meat or fish we cease to part take in our every day meals. This is a quick and easy bake, and better you'd get people to think that you whipped up something really fancy. Grind the small the onions, red chilly powder, green chillies, ginger and garlic together to a smooth paste. Saute the onions till transparent pink Then tip in the the ground paste and saute for 2minutes. Add in the fried potatoes, boiled cauliflower and fry till the masala is well coated to the vegetables. Fry on low flame for about 5 minutes. Add in the grated cheddar cheese and mix thoroughly. You would also want to check in on the seasoning, add salt only if required. Transfer to a greased baking dish. Into a heavy bottomed saucepan melt the butter, add in the flour and stir continuously till it forms a soft paste and bubbles. Careful not to brown the roux. Mix in the milk and keep stirring till the roux thickens. Add salt to taste, pepper and grated nutmeg and mix well. Pour the roux over the vegetables, Sprinkle with grated cheese and bake for 20minutes on 140 C. Sprinkle some chopped cilantro and serve warm with some garlic bread. Tip: Do note that 1 1/2dsp is equivalent to 1tbs. Forever I'm in a frenzy, a zillion list of things to do, places to be, people to call etc etc. I'm always short of time, because I have an active toddler who keeps me on my toes. I had to cook up something real fast so that I'm done for the day and tend to all my other chores and plus do my son's homework. A two year old with homework?? just picture sticking that's all! My mom gifted me this book written by a family friend on Classic Recipes of Kerala - A series of 5 books. I never got to personally thank Ramani Aunty for her culmination of recipes. 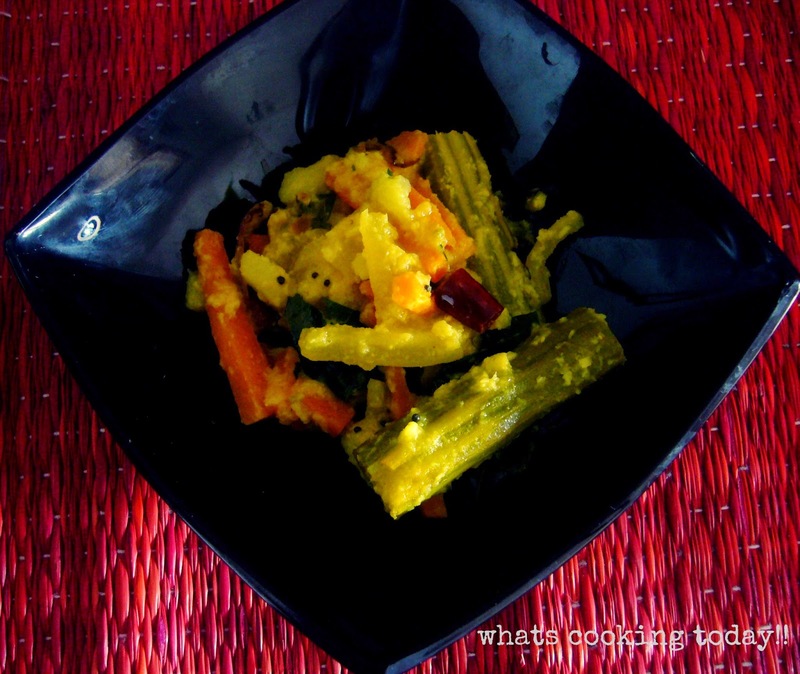 This is also my entry to this month's Think Spice - Think Turmeric event hosted by Sudeshna. Into a non-stick pan, combine the powders with the chicken pieces and water. Cover and cook for 20minutes on high flame and 5 minutes on low flame till the chicken is coated with the masala and the chicken is done. In the meantime, saute the onions till evenly browned, fry the curry leaves too. Fry the cooked chicken till it is browned on all sides. And voila!! you have a quick saute ready! I was at the cash counter getting all my provisions billed when my eyes darted to this magazine, Cooking and more by Tarla Dalal [Issue 1 Volume 8 May June 2009], got it quickly billed as it was sealed. Couldn't wait to get home to unravel what the magazine had to offer me. That's when this recipe of 'Date and Prune roll' simply mystified me. I had Prunes in the freezer thanks to my mum's obsession to dry fruits, I had a cup remaining. Just perfect for the recipe. I had the dates too....fresh ones from a friend who had come down from Bahrain. The rolls weren't as close to perfection as per the photograph in the magazine but then my husband and myself treat ourselves to 'One roll a day'. I have also made some changes from the original recipe to suit my preferences. Heat the clarified butter into a non stick saucepan, add in the dates and prunes and cook gently on low flame till it forms a soft lump. Remove, and add in the chopped nuts and mix well. Shape the mixture into a roll. Coat each roll with the sesame seeds and refrigerate to set. Tip: I did find it difficult to shape the mixture into a roll, so I used sesame seeds to bind the rolls and give it a shape. I also placed the rolls onto butter paper before refrigerating. Steaming Idlis and Tomato Onion Express Chutney! I'm like an upset apple cart when it comes to grating a coconut. For my morning chutney this time, I had some coconut gratings stashed in a zip-pouch in my freezer, like I always do!. My idlis though are made from ready- made batter, which I procure fresh from Nilgris Supermarket that's just a hop away from my apartment. Cheating isn't it? Saute the onion till transparent. While sauteing the onions add in the salt, to quicken the process of frying the onion. Add in the tomatoes and saute till nice and soft. Add the green chilly, coconut gratings, fennel and saute again for a minute. Take off from the flame and blend into a grinder. For the tempering, splutter mustard seeds and curry leaves, add the ground chutney warm it through, take care not to boil. Sprinkle coriander leaves and serve. Soak the rice and urad dal long with the fenugreek seeds in two separate vessels for about 3-4 hours. Grind the urad dal to a smooth paste adding water little by little. Then add the rice and grind to a smooth paste again by adding water little by little. Mix them both, add salt to taste and leave it to ferment overnight. If the batter has reached a thick consistency it could be used to make idlis. Grease the idli moulds with oil and fill each mould about 2//3rds full and steam for 5 minutes on high flame and another 5minutes on low flame. Allow to cool before scooping them out of the mould. Tip: Do not fret if there are no coconut gratings at all, the chutney is just as tasty without coconut. I have tried the version without the coconut, and you'd still end up a superb chutney. Chicken roast is our comfort food, uncomplicated, easy to prepare, tasty, flavorful and one way to reward yourself. Amma made these on the days she and appa would have to go play badminton at the Sports Center. Amma would ensure that dinner was kept ready for children. So after her power nap she'd get to making this quick dish, to be had with a simple salad and pita bread. In a pot combine all the powders and chicken with quarter cup of water for about 20minutes on medium flame. Cook till the water is absorbed and the chicken is pan coated. Simultaneously fry the potatoes in a wok till crisp and keep aside. Then fry the onions till browned and keep aside. Into the same wok saute the ginger garlic paste for about 2minutes. Then add in the cooked chicken and fry till the chicken pieces are roasted brown. Add in the chopped coriander and continue frying till the leaves have completely imparted its flavors. Add the fried onions combine the chicken well, check in on the seasoning, add more salt if required. Top the chicken with the fried potatoes and its ready to be consumed. Baby chechi is a 60 year old woman who makes a living by cooking for others. Since her husband passed away, the sole means of livelihood for her to raise her three daughters was for her to cook. She has the culinary skills to cook any, and I mean 'ANY' Kerala dish. She came to our house in Kerala 5 years ago, and more than a cook she has become an important member of our family. I had seen her come up with this quick saute...and thus sharing one of her delights. Heat a pan and pour about 3tbs of oil, splutter the mustard seeds, add the curry leaves and brown the onions. Tip in the garlic and chilly and saute for a minute, add in all the vegetables and saute. Fry for about 3-4 minutes on medium flame. Then add in the turmeric, aniseed powder and salt. Fry till all the powders are mingled in. Add a about 50ml of water, cover and cook the vegetable in the steam for another 5 minutes till done or all the water is evaporated. Serve hot and enjoy!! These muffins are tender, lower in fat and cholesterol unlike your regular muffins. And the low fat butter stands in for some of the oil. Elijah and myself had these little loves inside his little play tent. Let me also add that the bananas are fresh produce from my mother in laws garden. Preheat oven to 170 C. Fill each muffin hole with a paper muffin cup on a 9-cup or 12-cup muffin tray. Combine well the flour, cinnamon, nutmeg, baking powder, baking soda and salt. Mix in the brown sugar, oil, sour milk, egg white, egg and vanilla. Using the electric beater beat on medium speed for 3-4minutes. Gradually add in the flours and beat on low speed. Fold in the chocolate chips, mashed banana and nuts. Fill in the paper muffin cups about two thirds full. Sprinkle coconut. Bake for 15 to 20minutes until an inserted toothpick comes clean. Tip: To make milk sour, add about a 1tsp of lemon juice to the milk and warm it through till it curdles. Let it cool a bit before adding it to the batter. Rasam is known to cure a fever, aid in digestion and also has antioxidant benefits. For a simple rasam you would require.. In a saucepan, bring the water to boil add all the ingredients except the mustard, curry leaves (kept aside for tempering) and coriander leaves. Simmer for about 15 minutes. Blend all the ingredients and keep aside. Temper the mustard seeds shallots and curry leaves. Put the blended mixture back into the saucepan, pour the hot tempering and lastly add chopped coriander leaves and sprinkle some white pepper powder just before serving. Tip: Once the rasam is blended the mixture could be strained and the residue could be discarded. I prefer not straining the liquid because the goodness lies in the residue. Also if you are using tamarind pulp, about 50gms of tamarind should do. It should be soaked in warm water for 10minutes and then added to the rest of the ingredients and brought to a simmer. My toddler is at home he bunked playgroup, my brother is coming home after a week long of stressful examinations and my husband has been having back to back meetings at office the whole week. So I thought I'd bake a cake and treat everyone to an ecstasy of pure brown deep dark chocolate!! Sift together the plain flour, baking powder, baking soda and cocoa powder. Cream the eggs, essence, sugar, salt and oil. Beat till the sugar dissolves. Add in the sifted flours and yogurt and coffee mixture all at once and continue to beat well, scraping the sides of the bowl once in a while. Pour into a greased and floured pan and bake into a preheated oven of 140 C for 40-45 minutes till done. Heat everything except the icing sugar into a saucepan. Take off from the flame and add the icing sugar. Add the hot water teaspoon at a time until the desired consistency is reached. Tip: I wanted a slightly saucy effect so accordingly added the hot water teaspoon by teaspoon to get a loose consistency. The best plantain saute I have had is from my Aunt's house (my mom's eldest sister). When I was 14 I was sent away to boarding school in Trivandrum and my on campus local guardians were my Uncle, Aunt and my notorious cousin. So food was actually not a problem, because I'd be at my Aunt's place for lunch and dinner and after school tea snacks. This saute brings back old time memories of school and boarding days. Peel just a thin layer of the plantains leaving some green skin behind. Cut them into fingers and dunk them into a bowl of water to avoid discoloration caused by oxidation. Wash them several times and drain. Mix together turmeric powder and plantains with 1/2 cup water into a saucepan. Cover and cook till they are al dente. In the meantime, saute onions in a frying pan till brown, add the garlic and fry for a minute. Add the curry leaves, broken red chillies, salt and then the cooked plantains, fry till golden brown. Elijah (my son) and I were lazing in the front of the television watching cartoons when my phone rings. The name appears as "dad" (my father in law), he says that both he and my mother in law were coming right over to visit us. It's a Sunday morning, and I couldn't go to church as Elijah was not doing too well the previous night, so decided to be at home. Since our home is not too far from church, is the reason my in laws would have decided on a quick detour here. Never the less, I would have to come up with something to serve them because they would be famished, after a long church service. The previous day, I had watched Jun Tanaka on the show Cooking it, teaching a culinary catastrophe an easy, yet elegant dish, that had a restaurant appeal. I had the ingredients to the dish and thought I'd give it a try and serve my in laws with some style. This is also my entry to the monthly mingle brunch. Heat a wok and drizzle in some olive oil. Add in the onion and sugar, saute till translucent pink. Then add the ginger and garlic, saute for about a minute. Add the shredded chicken, sausages, soya sauce and combine very well. Toss in the peppers and coriander leaves and fry for another 3 minutes. Check in on the seasoning, add salt only if required. Take off from the fire and carefully spoon the mixture over a toasted bread. I have cut the bread into circles using a cookie cutter and lightly toasted the bread without butter onto a flat pan/ tava. Tip: I had cooked the chicken breasts in 1 cup of water, 3 cloves, 1 cinnamon stick, 1 star anise, 1 green cardamom, 1tsp of salt and 1/2tsp of white pepper for 25minutes on slow flame. The reserve stock can be used in making a soup, or to cook basamati rice if anyone is attempting a fried rice/ pulao. This dish definitely takes you through a taste trip of authentic Kerala cuisine. It leaves you with a nostalgic feeling of 'naadu'. By all means this should be consumed with piping hot steamed rice or tapiocas to make a wholesome meal. [I have used Cocum syrup for this recipe, if you don’t have cocum or cocum syrup available, a good substitute would be tomato paste. Wash and soak the cocum in 1/2cup of warm water for about 5mins. Heat oil in a non stick pan, splutter mustard and fenugreek seeds and curry leaves. Saute the shallots till almost browned. Add the powders and sauté till the oil separates. For those using the tomato paste add it along with the masala powders and sauté. Pour about 2cups of water and cocum with its water and bring to boil. Gently put in the fish fillets. Allow the curry to simmer for 20-30minutes on medium flame until the gravy is reduced to one third. Tip: You may substitute Black pomfret with Seer, Sardine or Mackeral. You may also want to ask your fish monger to skin off the Black pomfret or Seer depending on the fish being used. I also omit the head of the fish, I personally don't like using the head for any of my dishes. This dish is traditionally made in earthen pots. This method of cooking gives it that distinctive unique flavour to the dish. This dish can be served for lunch or dinner to go with your dosas and chapathis. Heat oil in a non stick frying pan and saute the onion, green chillies and garlic on medium heat for about 2-3mins. Tip in the okra, salt to taste and fry till the okra are nice and crisp. Sprinkle the peppercorns just before serving. Tip: Okra while cooking exudes a slimy ooze, take care not to cover while frying, you could spoon in more oil once in a while to eliminate all the ooze and yet maintain the crispiness of the okra. You wouldn't want the dish to turn out too oily. White radish and spinach kootu is the signature creation by my cook, which I have now mastered, though I would still love her to do the dish for me when she can. There is this ease with which she does this dish, and once done it needs to be instantly eaten with chapatis. My son in spite of the bitterness that exists in spinach has now gotten himself eating this too! Heat a wok and lightly coat with oil. Splutter the mustard seeds and add curry leaves. Add the onion and garlic and saute till it turns colour. Take care not to brown the onion, as the dish requires the sweetness of onion to slightly camouflage the bitterness of the spinach. Add the chopped spinach and radish and saute for about 3-4mins. Add a dash of water, cover and cook till the water is evaporated and the dish is almost done. Add the chopped chillies, coconut gratings and salt to taste, give it a good mix and the kootu is ready to be served. It goes well with rice and rotis. Tip: When I make this dish I do away with the coconut gratings, so that I can avoid unnecessary addition of cholesterol that comes from coconut. But if the bitterness from the spinach is too empowering, adding the coconut gratings would neutralize the flavours, making it easier for consumption. Beets are known to have innumerable benefits. My mum kept insisting that we consume this veggie once a week strictly. As obedient as I could get, I prefer sticking to a simple saute, and yes we have this once a week. You could make a thoran (a kerala- style preparation) by adding the natural sweetness of coconut gratings; owing to the fact that beetroots are naturally sweet. But then, I would rather use no coconut at all and savor the wholesome goodness of this wonderful purple vegetable. Lightly coat a wok with oil, splutter the mustard seeds and curry leaves. Then add the garlic saute for a minute, tip in the beets and turmeric powder and saute for another 5mins. Add a dash of water, cover and cook for another 3-4 mins till all the water is absorbed and the beets are al dente. Add salt and the crushed peppercorns. And there you have a saute dish ready in a matter of minutes. Tip: You could chop the beets finely, add about 3-4 tbsp of coconut gratings and some cumin powder to make a thoran. Remember to omit the peppercorns for this kind of a preparation as they don't quite go well for a thoran. I saw this recipe on my friend's website "Maria's menu" and instantly knew what I could make for my brother's birthday. For starters the recipe seemed simple and yet not something you would make everyday. Though my crust beneath was slightly burnt, the cake is absolutely moist and undoubtedly yummy. We had takers all the way. Preheat oven to 160 degree/325 F, 10 minutes before baking.Grease deep 20 cm-round cake pan; line base and side with baking paper. Combine butter, chocolate, sugar and milk in a saucepan; using wooden spoon, stir over low heat, until nice and creamy smooth. Transfer mixture to a larger bowl and let it cool. Whisk in the flours, then the essence and egg; pour batter into prepared pan. Bake for 1 hour. Test with skewer or toothpick and if it comes out clean. Remove the cake from the oven. Let the cake stand in cake pan 10 minutes then turn onto wire rack to cool. Bring the cream to a boil in small sauce pan; add in the white chocolate, stir with a wooden spoon until the chocolate melts. Let the ganache cool and then refrigerate, also take care to stir occasionally. Pour the ganache over the cake and let it dribble alongside the entire cake. Tip: You may want to cover the cake with foil halfway through baking if the cake is over browning. The cake I have noticed and as mentioned in the recipe does develop a thick sugary crust during baking.